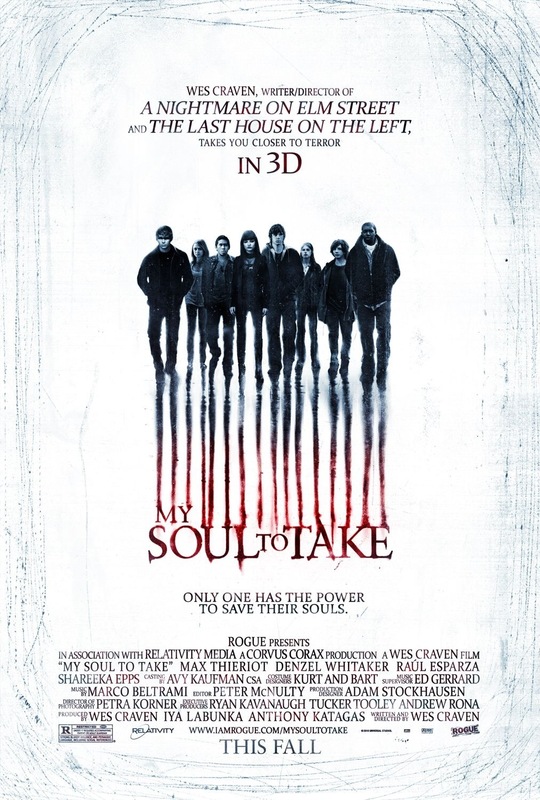 My Soul to Take is the first movie written and directed by Wes Craven since 1994’s New Nightmare; since that movie Wes has either written or just directed so there was a lot of hype among horror fans surrounding the release of My Soul to Take, but based off fan reactions the movie didn’t really make an impact and many hail it as the worst movie of Wes Craven’s career. Craven is an interesting filmmaker and even back in the 80s he was hit or miss. It’s kind of odd how he could make such an amazing movie and follow it up with something rather poor. As a whole there are 7 movies by Wes Craven I love and I hold 5 of those movies in very high regard and if I were to take those 7 films by Craven I love I personally feel they are just as good if not better than any horror filmmaker’s top movies, but the problem with Wes is again he’s always been hit or miss and while other horror filmmakers have done poor flicks I find most of the top genre directors a little more consistent. I went into My Soul to Take with very low expectations and the movie turned out even worse than I expected. Quite honestly this just might be the worst film Craven has made; The Hills Have Eyes Part 2 (85) and Cursed were both poor flicks, but at the same time they were kinda fun at times as well, but there really isn’t anything positive I can say about My Soul to Take. The screenplay by Wes Craven is poorly plotted, confusing with boring with lifeless characters and filled with idiotic dialogue. Certain elements of the movie kind of remind me of Shocker and A Nightmare on Elm Street and it’s never a good thing when you sort of rip off your own movies. The villain is silly and not scary in the least and as stated the characters were quite boring without a shred of depth. At the time of the release Wes Craven was 71-years old and it just seems he’s out of touch or maybe this was just a bad screenplay simple as that. As director Wes Craven doesn’t fare any better here than with his script; his scenes lack any suspense or tension and the scenes with the Riverton Ripper are quite silly and idiotic; My Soul to Take comes 38-years after Wes Craven made his directorial debut with The Last House on the Left and it’s unfair to expect him to still be at the top of his game since as filmmakers get older they generally don’t get better and this is more common within the horror genre. But I really didn’t expect Craven to deliver such a sloppy and poor paced movie devoid of any suspense or tension. Each scene is just as forgettable as the last and worst of all the entire movie is rather boring and even when there is action as stated it’s silly and idiotic. The performances range from ok to weak, but seeing as some of the dialogue was so horrible I’m not sure how much blame can be put on the cast. Emily Meade gives probably the strongest performance and makes a little more out of the character than the script had for her. The negative reviews for My Soul to Take are legit and this just might be the worst film Craven has made. There really isn’t anything positive I can say about the movie. It’s boring and confusing and very sloppy. If I’m gonna be totally honest this is a contender for worst horror flick of 2010. I’m sure fans of Wes Craven will still wanna check this one out, but keep your expectations very low.